CurliQue Beauty is much more than a boutique. It is an extension of our creative classroom, where education, retail and entertainment converge. It is our learning laboratory where students play, explore, discover, and gain real world experience. It is our gallery space and events venue where we inspire the public and empower our students. Nestled into the bright and beautiful bustle of Robson Street in downtown Vancouver, CurliQue is our epicenter of all things beauty. We throw our doors open each day to make our guests feel special, and our CurliQue Pro Artists are fiercely committed to creating a safe and welcoming environment. Every one of our team members is a Blanche Macdonald graduate, so they have a vested interest in supporting and mentoring students. At our regular CurliQue events, featuring live demos, seminars and vendor product trainings, we reveal the stories behind the brands. Creators and experts speak of their journey and give rare, exclusive intel on their products. High profile industry speakers share priceless wisdom, advice and expertise. We host evening support sessions and workshops specializing in everything from avant garde eye makeup to drag demos and bridal makeup. CurliQue’s sprawling gallery space is home to a host of unique lines. Our shelves are stocked with a mix of luxury products, industry favourites and cult brands, each lovingly handpicked for their excellence, reputation and backstory. We listen to our students and engage in social media, regularly bringing in buzz brands to reflect current trends and changing industry needs. CurliQue is also the only Make Up For Ever Pro Store in Western Canada. As a student you’ll enjoy a family discount, and have the exclusive opportunity to get to know the story, scent, look and feel of hundreds of products. The CurliQue mantra is “Be the light, and always reveal your best self.” It is our mission to provide an unparalleled retail experience, so our students and customers can put their best self forward – today, tomorrow and every day after. Our Q Talent Artists have their brushes poised and ready to realize your every beauty whim, from special event shimmer, daring drag and evening glam to a refresher on your everyday glow. Whether you’re having a big night out, or a fabulous night in, the CQ team will help you create your new favourite look. 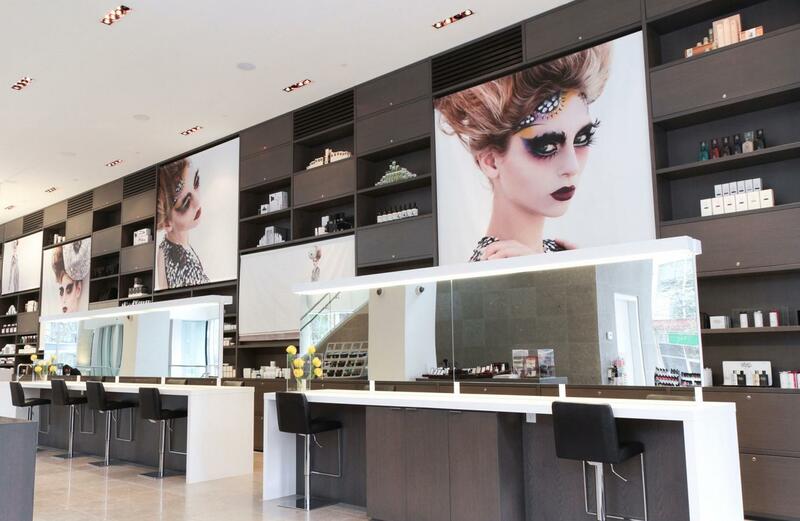 To book an appointment email events@curliquebeauty.com or call 604.685.5508. Bring your glam squad! We offer group bookings for makeup loving coteries of five or more. Whether you’re looking to make your #squadgoals happen for an extra special night, glam out your bridal party, surprise a pal with a birthday beauty fiesta or gore it up for Halloween, we are here to make the makeup magic happen for you and your friends. We can even work in our Hair Services! Have an idea? Tell us about it! Let’s see what sorts of fabulous plans we can dream up together. To make a group booking email events@curliquebeauty.com or call 604.685.5508. Learn from the experts in our Creative Classroom! At CurliQue we regularly host complimentary workshops, demos and events featuring specific themes, products or skills with our CQ Talent and other Makeup VIPs. To find out more please visit the CurliQue website and follow us on Instagram! We also offer private, customized workshops to businesses, teams, organizations or individuals looking to organize a special educational event. For more information, or to plan your workshop, please email cqworkshops@blanchemacdonald.com. Give your loved ones an extra special treatment too with our CurliQue Gift Cards! All makeup applications, special event makeup, makeup lessons, and groups must be booked in advance. From visionary Kevyn Aucoin’s signature makeup line to the eye-popping palettes of Morphe and the organic indulgence of Sappho New Paradigm – created by our very own graduate, Joann Fowler – we have curated the most coveted collection of high calibre makeup, hair and skincare products in the city. CurliQue is a destination for professional makeup artists seeking Industry favourites such as Cinema Secrets and RCMA, and we are the only Make Up For Ever Pro Store in Western Canada. Our hair lines, used in our adjacent Q&A Salon, include the Cuban Lily-scented luxury of Oribe and eco-conscious industry darling Kevin Murphy. We also feature a range of highly respected skincare brands, from the pure botanicals of The Ordinary to the elegant simplicity of Embryolisse and Dermologica, the world’s leading skincare brand. Many of the products we carry are exclusive to us in Canada, and our expert CQ Talent Team – who always have their fingers on the pulse – are continually updating our offerings with the most in-demand and on-trend brands available. For a full list of our current products please visit the CurliQue website.